Now that you have your appointment book full of pending MedsChecks, the next challenge is to ensure that your customers turn up as scheduled!!!. Schedule management is making sure that the number of No Shows are kept to a minimum. Appointment slips assist consumers to remember the appointment details. SMS appointment reminders are sent to consumers (if mobile number recorded) leading up to the appointment date. 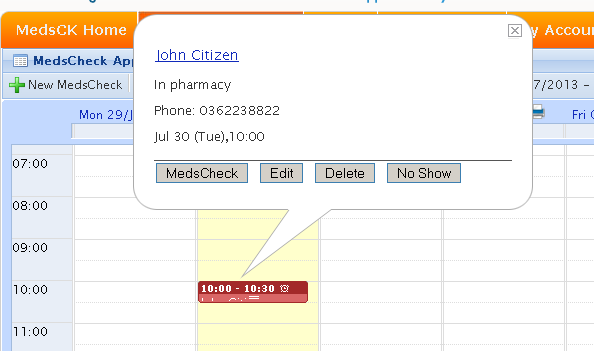 The MedsCK daily run sheet provides a mechanism whereby assistive staff can confirm coming appointments. No Shows can be tracked and monitored, allowing management to implement No Show mitigation strategies if the numbers become a growing problem. Appointments are colour coded. Monthly view provides pharmacists the ability to gauge proportion of booked MedsChecks that are not being completed (Completed: grey; Open: red; No Shows:green).